Towards the end of our last podcast, I did a bit of hand-waving when it came to how we sent and received the test beacon data over the radio. I quickly walked through the setup of the major pieces of software involved, but skipped over all of the details. Today, I’ll be walking through those weeds. On the transmission side, we have the second sample sketch available from the UKHAS site (link: http://TinyURL.com/UKHAS-NTX2 ) running on the Arduino sending the test beacon data through the NTX2 transmitter. Plugged in the USB stick. When Windows prompted me to install drivers, I cancelled it. I can’t remember if it asked me to do this more than once, but if it did, I cancelled both attempts. I ran Zadig.exe. 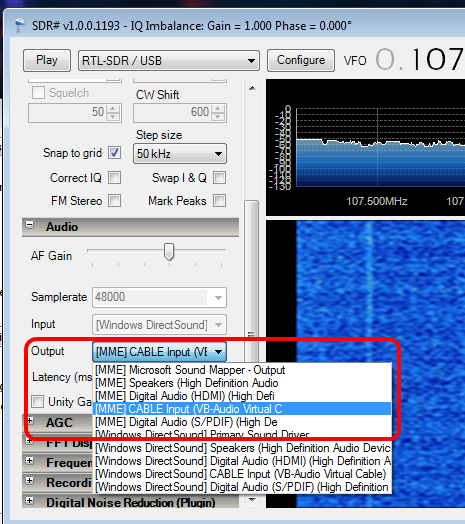 This is one of the EXEs that was installed to the /sdrsharp folder created by Install.bat. It should have had WinUSB selected by default. I clicked “Install Drivers”. I closed Zadig when it finished. I plugged in the antenna. 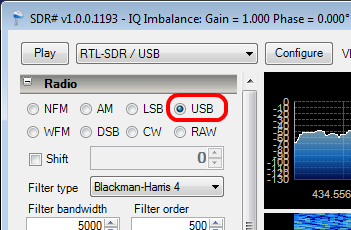 To initially test it, I first selected “RTL-SDR / USB” from the drop down (my device), then clicked “Configure”. 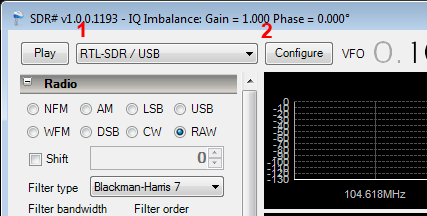 I think the key things that I tweaked on this dialog were the Sample Rate and the RF Gain. I clicked Close to return to the main screen. I set the frequency to 107.7 MHz, a local rock station, checked “WFM” (Wide FM) and hit “Play”. 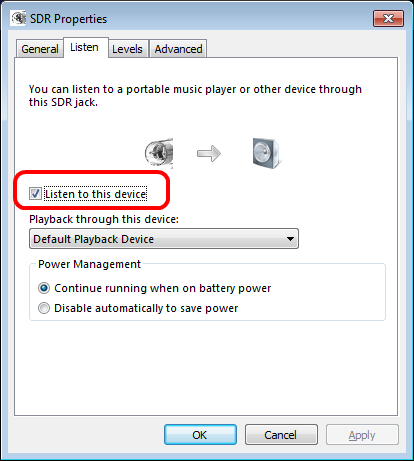 That worked – I could hear the radio station coming in fairly clearly, even in my basement, and I could then use the mouse wheel to change frequencies to other radio stations. I could also change it manually. Now that I had the receiver and SDR# working, it was time to try it out with the NTX2. To decode the data, we would be using dl-fldigi, which was a free download. While the source code is available off of Github, there are installers and binaries available off of the UKHAS site here: http://ukhas.org.uk/projects:dl-fldigi. Once that was installed, I fired it up. 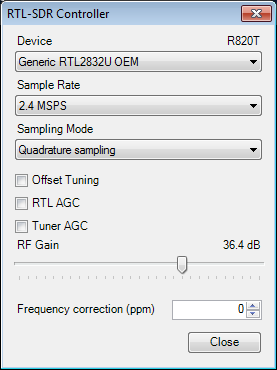 I initially spent 15 minutes or so trying to figure out a way to feed the output of SDR# directly the input of dl-fldigi, but didn’t have any luck. I began to wonder if I needed something else to bridge the gap. I found yet another page on the UKHAS site that described just such a bridge: VB-Audio. 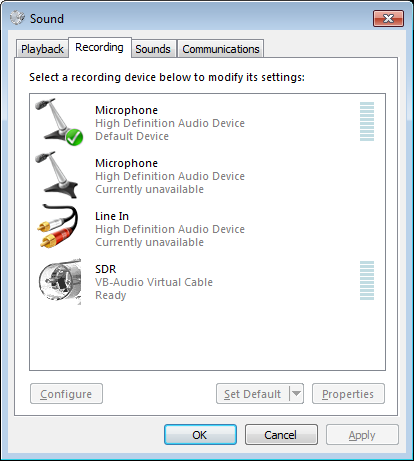 You should see an input called Virtual Audio Cable. 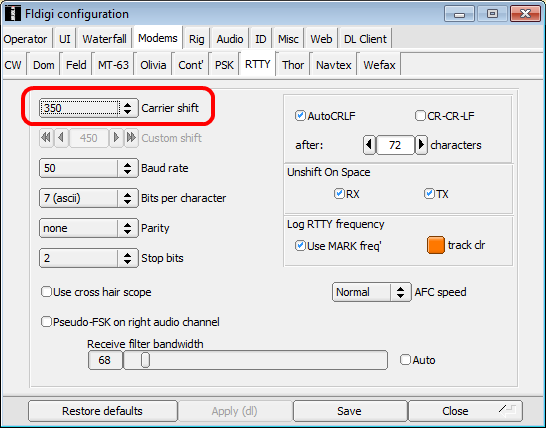 Click properties and rename it to SDR. I had to position the red line just to the left of the signal, otherwise it wouldn’t work. Even though the NTX2 reports that it was transmitting at 434.650 MHZ, I could only really pick up the signal if I tuned the receiver to 434.635 MHZ. Next, I started dl-fldigi again. 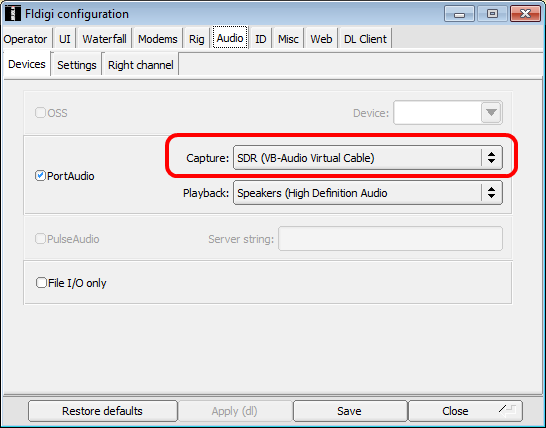 I clicked Op Mode / RTTY / Custom / Audio / PortAudio / Capture, and selected “CABLE Output (VB-Audio Virtual” from the drop down. I clicked Close to return to the main screen. 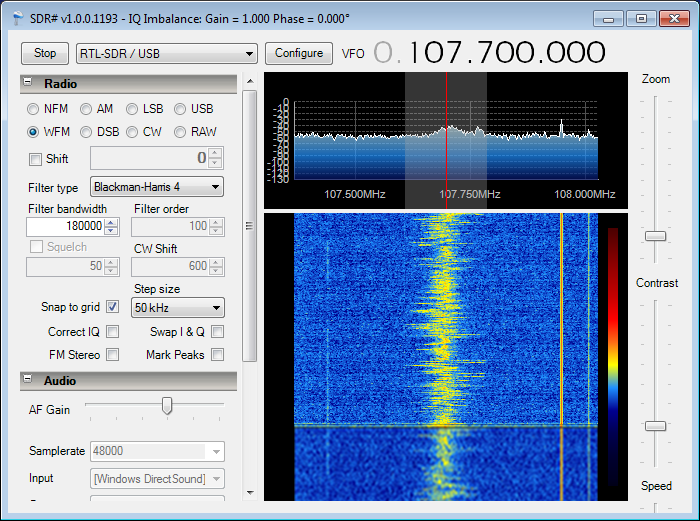 Finally, once I had everything configured, I had to adjust where the two red “data” lines appeared in the waterfall trace by tuning SDRSharp. Once I could see that, I could match the two red “tuning” lines with the data lines, and actually start seeing data appear in the data box. First, if the two in the latter were too far apart, they wouldn’t match up with the data lines in the waterfall trace. To fix that, I needed to adjust the carrier shift (otherwise, I wouldn’t see the data coming through). Second, if the red lines were lined up with the signal in the waterfall, I would only see gibberish in the data window. To fix that, I simply clicked the left data line in the waterfall to force the tuning line to match it. The other line would stay in lockstep, always the same distance away (as determined by the carrier shift). 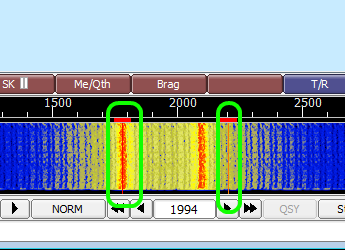 Finally, I also found that as I tuned SDR# up or down, the data lines in dl-fldigi would slide left or right. 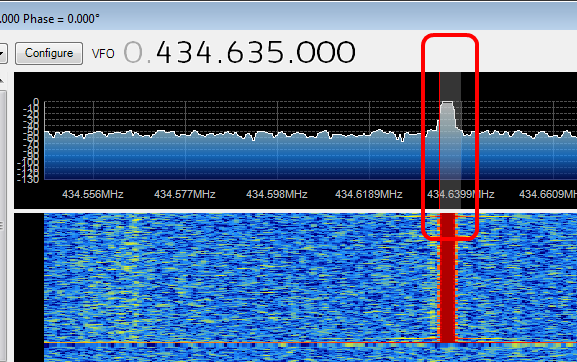 If I let the signal slide away from the SDR# band completely, it would disappear from the waterfall trace in dl-fldigi. This is something I need to keep in mind if I have problems getting the data to come in properly when we were out in the field trying to track the balloon while it was in flight. There you have it. The basic setup for our transmission and receiving station. We still have a long way to go to getting the NTX2 fully incorporated into the instrument cluster, but Katherine and I feel we at least have a good foundation now.